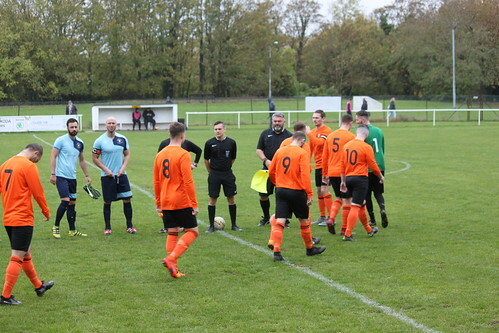 Buckingham Athletic’s Ash Farmer has spoken to Sports Shots as his current club face his old side, Winslow United, in an exciting looking Berks & Bucks Senior Trophy, 3rd round tie on Saturday afternoon. Farmer played under Perry Mercer and Terry Shrieves at Elmfields gate in a successful time, something he looks back at fondly. I enjoyed my time at Winslow and have many great memories. It is a very well ran club with some great people involved there. I was lucky enough to get the chance to play with not only my mates but some very good players, some of which are there now so it’s always nice to catch up when we do play them. The Athletic man go into the game off of the back of a good victory last weekend – Images below by Luke Stafford. The Hatfield victory turned out to be a good result for us in what had the potential to be a tricky game. We had several players missing for this game due to injuries and suspensions and when you go in 0-0 at half time you wonder if it’s going to be one of those days. Luckily we’ve got a very good group of players who stick together and once we got that first goal which we always believed we would, the rest was pretty plane sailing. In the end it turned out to be a comfortable victory. When the draw was made for the county cup, there was no doubting the tie of the round. For us, and probably the Winslow lads too, this is one of the biggest games of the season. It’s a local derby which I had always heard a lot about before I joined, and after we beat them at the death earlier on in the season I am sure they’ll want to get some revenge. It always attracts a crowd and although there is no points up for grabs I’m sure both teams will want to progress through to the next round of the Berks & Bucks Senior Trophy. It’s always nice and good for confidence to go on a cup run! As with all local derbies, form can go out of the window, but the two sides go head-to-head with very impressive records. We are at home Saturday, and currently unbeaten there this season so we’ll be looking to extend that run. We know Winslow are flying at the moment but the same as any other game we will want to be solid and hard to break down before anything else, so I’m sure the gaffer will set us up to do that. Hopefully going forward we will have enough to score goals and get a result. Farmer believes there is more to come from his Athletic side. So far it’s been a good season, we are improving every week and have come on leaps and bounds since pre-season. We’ve got a great group of lads and hopefully we can win our games in hand in the league and push on up the table! Up The Ath!